A sneaker meant for the courts to casual, is fitting for the Air Jordan Original 9 (IX) Olives. Featuring a Black leather upper, Olive starting at the heel and ending at the toe cap, followed with Red accents. 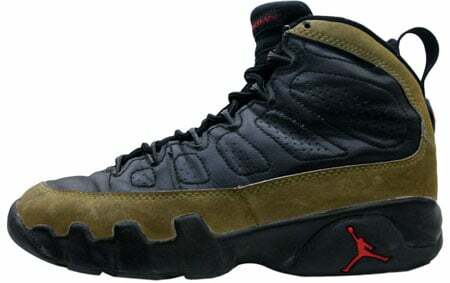 The Air Jordan Original 9 (IX) Olives released in 1993, with a retail price of $125. Michael Jordan did not wear the Air Jordan Original 9 (IX) Olives on the court, nor did he wear any OG Jordan 9 (IX).